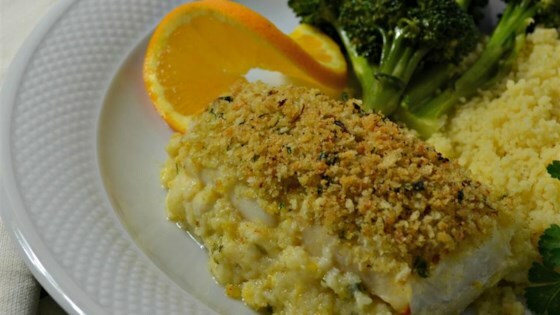 "This dish uses oranges with haddock which is a change from most dishes that use lemon with fish or seafood. It's a nice refreshing change. It pairs well with veggies, like asparagus, broccoli, or zucchini. For starch you could do mashed or roasted potatoes, risotto or couscous." Arrange haddock fillets in a large baking dish. Season with salt-free seasoning blend. Pour orange juice over fish and cover with plastic wrap, reserve orange zest. Marinate in the refrigerator for at least 2 hours. Stir panko bread crumbs, Parmesan cheese, buttery spread, parsley, thyme, and reserved orange zest in a bowl until well mixed. Press crumb mixture over haddock. Bake in the preheated oven until fish is easily flaked with a fork and topping is golden brown, 20 to 25 minutes. Allow fish to rest 5 minutes before serving. You do not need to use panko. You can use any other bread crumbs of your choice, although I prefer the crunch of panko with fish. I didn't add any extra salt to this dish. But if you need the extra seasoning, add salt and pepper to your content. I love the orange flavor with the fish. The orange zest really adds a lot of flavor. This tasted light and fresh while I was eating it, but it kept coming back to haunt me for the rest of the night. Most likely will not make this one again. Sorry! Awesome fish dish! So easy. I didn’t let it marinate for 2 hours. I probably only let it sit for about 30 minutes. Tasted great! Also didn’t add any orange zest. My husband loved it too.